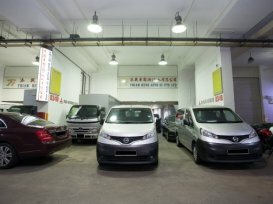 Thiam Heng Auto with in providing commercial vehicle rental. With a fleet of over 120 vehicles, its easy to find what you like. Furthermore, they are backed by their own subsidary workshop, Thiam Heng Motor. Therefore, their vehicles are all in tip-top condition, and all repairs are dealt wth promptly. They are also a member of ARTAS (Automotive Rental Trade Association of Singapore), and you can can trust them to be professional and honest. Rented a commercial vehicle from them, since a year back. I should said they are honest, and sincere. I highly recommend Thiam Heng. Over 80 vehicles ranging from small pickups to large 10-ton lorries are available for rental. We can even arrange special requirements if necessary for our commercial vehicles. Please do not hesitate to contact us for any enquiries about our services.